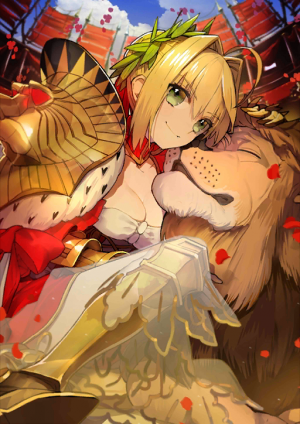 This article is about the 4★ Nero. 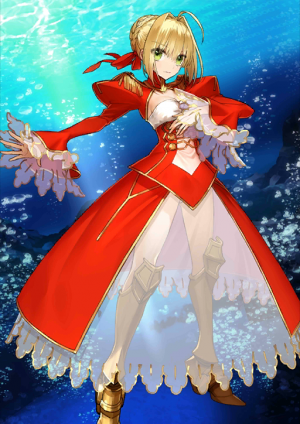 For the limited 5★ , see Nero Claudius (Bride). 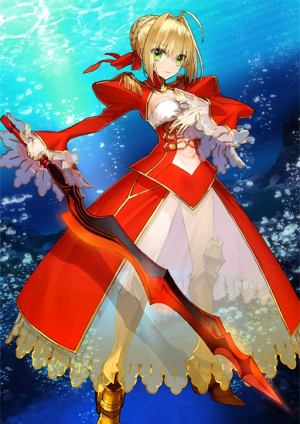 For the limited 5★ , see Nero Claudius (Caster). Grants self Guts status for 5 turns (3 times). increase Arts Card performance of all allies by 15% while on the field. A mighty emperor, and self-proclaimed "beauty in men's clothing," she is both narcissistic and selfish, but also bright and openhearted. Her childish purity gained her the adoration of all her subjects. 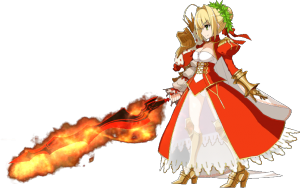 Her True Name is Nero Claudius Caesar Augustus Germanicus, the fifth emperor of the Roman Empire. She is an infamous tyrant whose entire life was colored by conspiracy and poison. 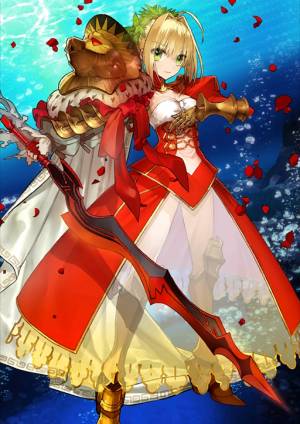 Umu, leave everything to me! Self-proclaimed artist, she has her own sense of aesthetics. Loves pretty boys and handsome old men. Loves pretty girls even more. Loves beautiful things regardless of what they are. Proclaims that she is the pinnacle of art, but also claims all sorts of people's lives are beautiful as well. ...It goes without saying that the way she enjoys life is almost like herself, a beautifully bloomed rose. Skills she normally wouldn't have can be gained momentarily because she declared it. This is the perfect skill for Nero who is the manifestation of passion. She gains skills such as Riding, Swordsmanship, Arts, Charisma, Tactics...etc. 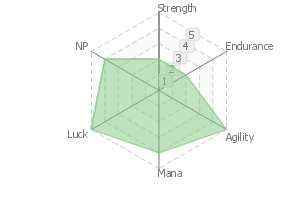 If the skill is above Rank A, the physical burden (such as Divinity) is gained as well. Invitation to the Golden Debauchery Theater. An absolute emperor's field that fulfills her desires. A magical recreation of the theatre "Domus Aurea" she designed herself and built in Rome when she was alive. It creates a battlefield that works to her advantage. The emperor who put the happiness and prosperity of the Roman people first. Also enjoyed living life, especially when it came to musical theater. Those who heard her sing were traumatized for three days and three nights, and saw dreams (nightmares) of roses. The emperor that suppressed all religious forces and the Roman Senate around 50-60 AD. Called a tyrant in the Roman days because of her position against the senate and the oppression of the Christians. Self-styled, cross-dressing beauty. Despite being selfish and self-supremacist, she is cheerfully openhearted, an almighty self-indulgent emperor who was loved by the people due to her child-like innocence. 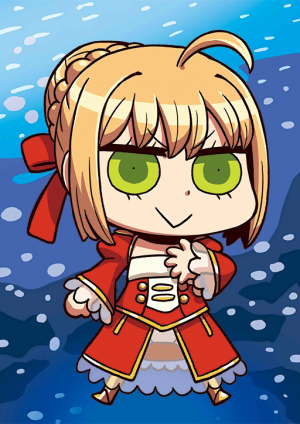 Her real name is Nero Claudius Caesar Augustus Germanicus. The Fifth Emperor of the Roman Empire. Calling herself an artist, she possesses a unique sense of beauty. Likes pretty boys and handsome elders. Likes pretty girls even more. She loves anything so long as it is beautiful, no matter what it is. While insisting that she herself is the supreme form of art, she also extols the lives of all people as beautiful. ...it goes without saying, but that figure of hers - that enjoyed life in such manner - was in itself a single rose in full bloom. Even Skills that originally could not be held, can be acquired for only a short time through the insistence of the person. 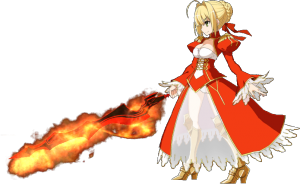 The compatibility between this Skill and Nero, with her passionate soul, is extraordinary. Corresponding Skills are Riding, swordsmanship, arts, Charisma, Military Tactics and etc. If the rank is A or above, even physical burdens (such as Divinity) are acquired. An Emperor that considered the happiness and prosperity of the people of Rome as being foremost.She herself is also an expert at enjoying life, and particularly in regards to opera, she possesses the self-confidence that there is nobody superior to her. (just self-confidence) It has been said that those who listened to her song were tormented by its impact for three days and three nights, and even had rose-like (bad) dreams. The Emperor who, at the Rome of 50~60 AD, oppressed the Roman Senate and all religious factions.In the Roman Era, her stance towards the Senate and the oppression imposed on Christians caused her to be called a tyrant.From such anecdotes, she is put on par with the Number of the Beast, the Whore of Babylon who destroyed cities in the Old Testament, but...? 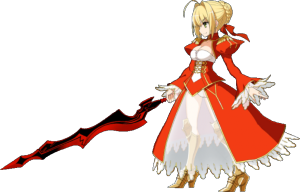 Nero's theme from Fate/Extra plays during her NP, "Everything Is In Your Hands". Received an animation update during Nero Fest 2016; for the original sprites, see here. The NA version launched with the updated animations. This page was last modified on 20 February 2019, at 10:44.